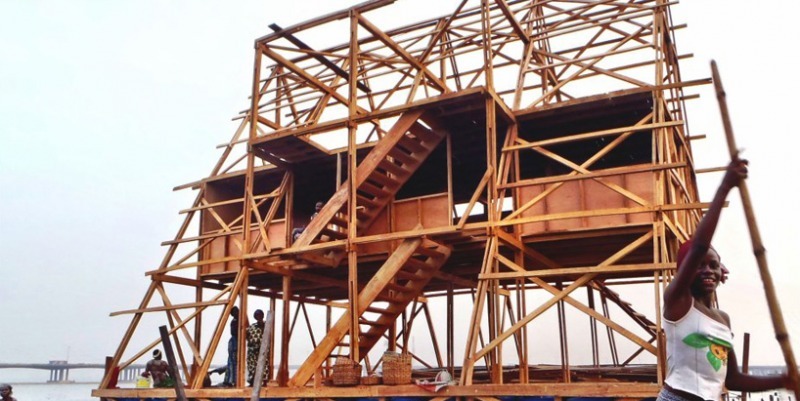 Initially, the School project was designed as an extension to the existing school building which is built on reclaimed land in the community of Makoko in Lagos, Nigeria. In July 2011 a flood occurred in the community and the existing school and playground were submerged in water; which suggested a radical shift in approach for an innovative solution. Since the last few years floods occur more frequently in Lagos, the new school would have to actually float to avoid oncoming flood issues. 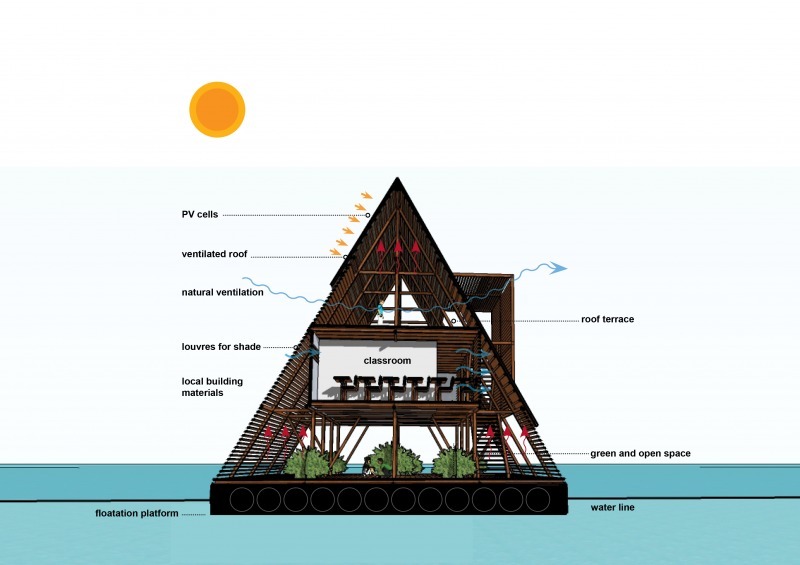 The Makoko Floating School is not only a great example of a design result but also a development idea for communal contribution. NLÉ’s vision has always been to propose projects that are not only aesthetic statements but also social contributions for this rapid urbanized world. One of the many project challenges was to comprehend the social and environmental problems that the city of Lagos is facing today together with many more cities in Africa. Research indicated that the Makoko Community dealt with a multitude of issues such socially, technically as-well as sanitary. 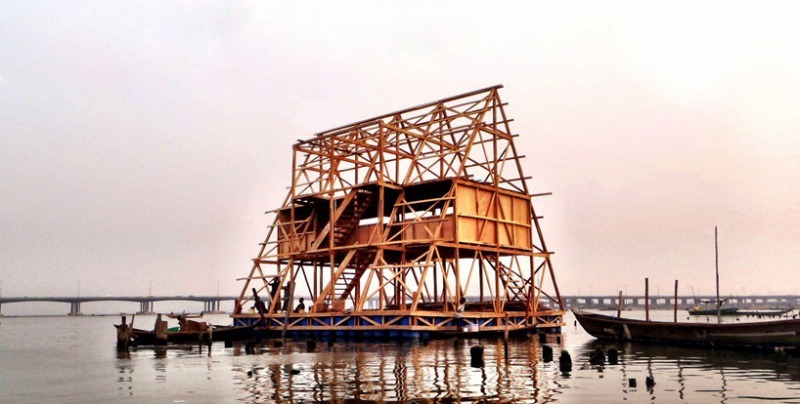 The first phase was to formulate a thorough research and analysis about Lagos and the community of Makoko in-terms of their spatial and social relationships. This particular task was quite of a challenge, since not much information is to be found online. However the persistence of the team along with the local knowledge of Adeyemi, the comments and advice from the Heinrich Boll Foundation project manager Monica Umunna and the inside information from community people such as, Noah (the headmaster of the School)) were incredible valuable. In the eyes of designers and urban planners, Makoko is an astonishing place. The community is built by these delicate simple wooden structures creating harmonically an urban grid built by the locals and (unconsciously) shaping a beautiful organic urbanized area. 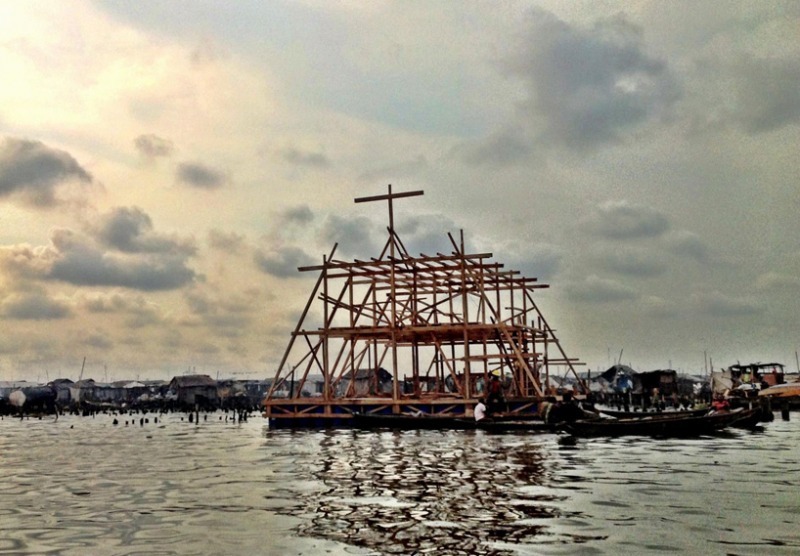 The landscape of the houses on stilts offers serenity above the water (Lagos Lagoon). The smoke coming out of some houses where fish is being smoked while thousand of little canoes are being driven peacefully around the water infrastructure. Let’s not forget that Lagos is blessed with sunshine most of the year with a warm breeze that surrounds the community. People are happy there; smiling and playful children with an incredible sense of balance are jumping around from one tiny wooden border of a canoe or a house to another. Everything that floats which is found in the Lagoon becomes a toy or/and a mobility device. Everything is useful to build this community. Despite the ‘urban legend’ that most African people don’t swim, specially in water front cities like Lagos; the people of Makoko are expert swimmers. Overall, they are a society living on water. Most of the community’s economy is based on fishing economy. In fact it provides to 2/3rd of the Lagosians Fish needs. While men are fishing, women are cooking and selling the smoked fish; a true community inclusive economical and social system. While ‘canoeing’ around Makoko one could see a lot of the young the population; thousands of children are curious of the visitors and usually start yelling the word: ‘oyibo’ which in Yoruba (native Language) means ‘white people’. Also, the smell of the community is a unique experience some being part of the smoke of the fish cooking but mainly due to human waste in the lagoon. There is still not a total understanding on how to avoid the amount of garbage produced and wasted in the lagoon; that causes a large health risk for the community. Perhaps, waste is one of the largest issues and challenges the community had to face. The challenge of building on water is not the actual buoyancy of the building, but rather stability. In other words, the most critical engineering question is what happens when they, all people on the building, move to one side? One of the main principles of achieving stability on water is that the height of the structure is in a direct relationship with the width. The width can never be smaller than the height of the building or it could topple over. What all boats have in common is that they have a low center of gravity. Keeping the center of gravity lower makes the boat more stable, hence the steel keels under most sailboats. The concept was born from this principle: keeping the center of gravity as low as possible was achieved by using a triangular form, as this shape has a low center of gravity. 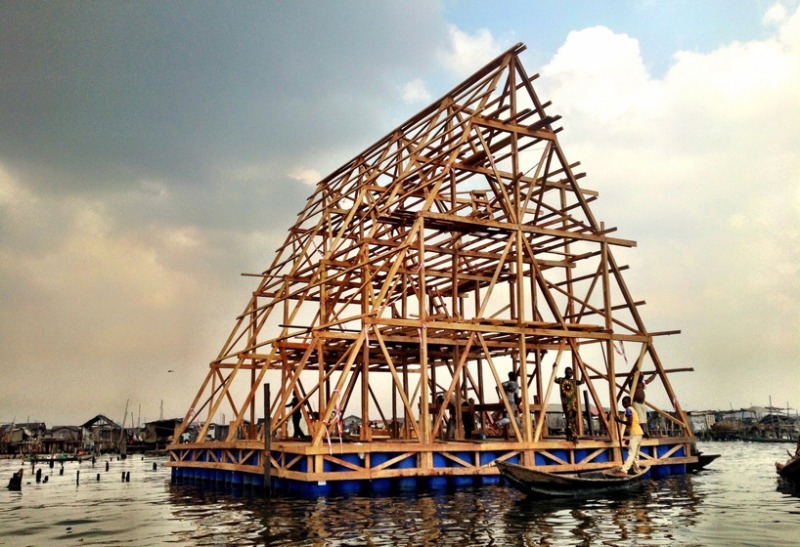 The wood used for Makoko Floating School is all locally sourced, as Makoko is the heart of Lagos’ timber industries. Logs from the tropical forests upstream will be floated to Makoko, where the sawing mills then process it. For this reason, there is an abundance of timber in the area. The school structure was developed to be built with one section size, so all connections would be the same. The building floats on 256 recycled oil barrels. As Nigeria has a big oil industry, these are all locally produced and available. The barrels collectively produce enough buoyancy to allow +- 200 people on the school, and are very durable. The school collects rainwater for flushing the toilet, and produces its own electricity with solar panels. 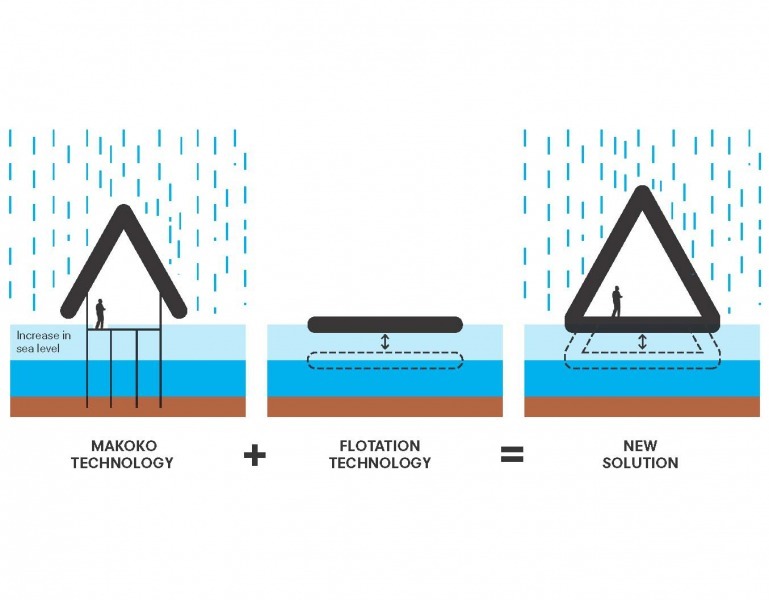 The toilet, one of a few in all of Makoko, has a filtration system and recycles waste. There are openings for natural ventilation in the prevailing wind direction, which keeps the classrooms quite cool. Lagos has a tropical wet and dry climate. Rainy seasons occur in with the heaviest rains falling from April to July and a weaker in October and November. Due to heavy rains the area suffers from seasonal flash floods. Often times, the flooding is lethal particularly in overcrowded areas and slum neighborhoods where drainage is poor or does not exist at all. Description: A great example as a design result and community development.